RVers and Work Campers looking for seasonal work in Washington State this fall can consider applying now for one of the 90 positions at the new Cabela’s Outpost store scheduled to open this fall in Union Gap. 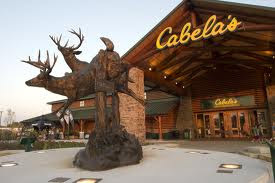 The 40,000-square-foot Outpost will offer its high-quality outdoor recreational outfitting gear, including hunting, fishing, and camping supplies, in an environment of superior customer service – the hallmark of the Cabela brand. The new store’s general manager says they will be looking for people who are passionate about the great outdoors and enjoy sharing their knowledge in an outgoing and personable style. Those interested must submit an application online at www.cabelas.ca/careers. Click on “Apply Now,” then “United States Jobs.” Then follow instructions to log in; search for Job Number 3905BR and follow the application process. Interviews will begin July 11 and continue through July 14. Please note: applying does not guarantee an interview. 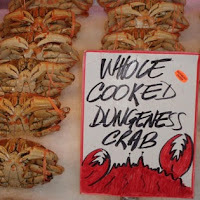 On the northern coast of the Olympic Peninsula, and close to the town of Sequim, the Dungeness Recreation Area encompasses the famous Dungeness Spit, bluff-top hiking trails, and beautiful campgrounds. You may think you’ll come just for an overnight, but chances are good you’ll want to stay longer. 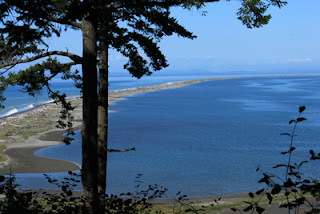 The forested campground, open from February 1 through September 30, features 64 gorgeous sites, which sit atop a bluff that overlooks the Strait of Juan de Fuca. Pack a lunch and walk along the mile-long scenic bluff trail to a picnic table with awesome views. As numerous seabird species soar overhead, you can watch the incoming freighters and outgoing cruise ships ply the waters below. The weather will likely be in your favor, too, as the area boasts a mere 18 inches of rain, thanks to its position in the Olympic Mountains rain shadow. The six-mile-long Dungeness Spit is the longest sand spit in the U.S. and among the longest in the world. The Light Station (operating since 1857) makes a great destination for ambitious walkers; just be sure to check the tides and give yourself about six hours for the round trip adventure. Other great activities in and around the Sequim area include bicycling, kayaking, U-pick berries and lavender, fishing, boat tours, the Olympic Game Farm, and numerous summer festivals (we’ll tell you more about some of these in the coming weeks). 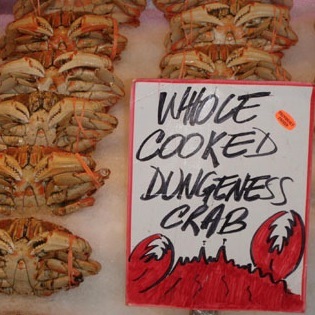 And whether you order them in a local restaurant, or bring them back to the RV for a campfire boil or bake, don’t miss the chance to taste the delicious Dungeness crabs that live in these nutrient-rich waters. Washington State Ferries: Way to Go! The Washington State Ferry summer sailing schedule is officially in place and, with a little pre-planning, taking your RV on a mini cruise to the San Juan Islands or Sidney, British Columbia is part of the quintessential Northwest experience. Once you park your RV onboard the ferry, take a walk upstairs and onto one of the decks for gorgeous views. If the weather is fickle, just grab a table by the big windows and enjoy the views anyway. And keep a lookout for soaring eagles and the graceful orcas that frequent these waters! • Otherwise... plan to arrive at your terminal of departure at least 45-minutes in advance of departure. On busy summer weekends, getting to the terminal extra early is advisable, since getting on the ferry is based on the first-come, first-served rule. • Fare amount is based on your vehicle length, height, and width and the length of distance you’re traveling. • Half fares (off the regular passenger rate) are available for seniors (65 and older), people with disabilities, and those with a Medicare card. • Children under age 6 travel for free; ages 6-18 are discounted 20 percent. All WSF terminals accept VISA, MasterCard, American Express and Discover Cards, as well as debit cards, cash, and travelers checks. Personal checks are not accepted. A new, online color-coded tool gives you the chance to avoid the busiest times and long lines for various routes. On the right side of the page, look for “Best Travel Times” and click! 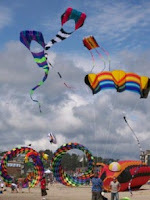 A sure sign of Northwest Summer is the annual Kite Festival in Lincoln City, Oregon. Next weekend, June 23-24, a kaleidoscope of colorful kites of every shape and size will soar above the sand and sea in what Kitelines Magazine has called “one of the best places to fly kites.” Both professional and amateur kite enthusiasts show off their inventive creations, from 3-D box kites to animal shapes to fanciful imaginary creatures. This year’s theme is Stars and Stripes, so expect to be dazzled by red, white, and blue. The weekend includes kite-building workshops, demonstrations by expert kite builders and flyers, a kids kite parade, and a Saturday evening Night Fly with illuminated kites and live music on the beach. Glacier National Park visitors have the chance to learn about the history and experience the culture of Native Americans this summer in a unique series of interpretive programs. Members of the Salish, Kootenai, Blackfeet, and Pend d’Oreille tribes share stories, songs, and dances as part of the long-running Native America Speaks program, made possible by donations from the Glacier Association. The events take place throughout the park, at campgrounds, in lodges, and at the St. Mary’s Visitor Center. Highlights this summer include Grammy-nominated Blackfeet singer, Jack Gladstone, who presents “Buckskin Poet-Songs,” an entertaining and educational program of original live music. The Two Medicine Lake Singers and Dancers interpret Blackfeet culture through lively narration and colorful dance demonstrations, including the traditional grass dance. The programs, presented in traditional dress and using authentic instruments, offer a memorable National Park experience and excellent photo opportunities. For a schedule of 2012 events and locations, visit the Glacier National Park site. The last thing the state parks of the U.S. northwest coast need is to spend their already tight dollars picking up and hauling away Japanese tsunami debris from their beaches. But in Oregon, it's already happening. The huge Japanese dock that washed ashore at Agate Beach State Recreation Area near Newport needs to go. Already, Oregon Department of Fish and Wildlife staff, paid contractors and volunteers have removed about a ton and a half of plant and animal material. Now comes the 66-foot long, 132-ton dock itself. Six companies have bid to remove it, either in pieces and hauling it off, or towing it away. The cost: Low bid $79,922, high bid $240,000. The winning bid is expected to be announced next week. "The cost is solely on us," said Chris Havel, spokesman for the Oregon Parks and Recreation Department. "No one else has stepped up to help out. About $20,000 was already spent on other issues before this first wave of tsunami debris began to arrive. This will decimate our budget." The park system's biennial debris budget for debris removal is $135,000. That covers the removal of dead animals, derelict vessels, plastic and aluminum cans, buoys and other material that washes up. "We don't know if anything big like this will show up again but what we do know is that removing even the small debris will quickly overwhelm our trash systems," said Havel. The department and other partners are working on a coast-wide plan for disposal of tsunami debris, and exploring longer term funding for the effort, but details are still in the works. Meanwhile, other Pacific states anxiously await the arrival of the debris on their own shores. By some estimates, the area of the debris field is twice the size of Texas, some of which may be radioactive from exposure to the damaged Fukushima Dai-ichi nuclear facility. The Oregon State Parks website offers a direct link to the excellent 2012-2013 OREGON STATE PARKS GUIDE. The digital version is perfect for those who prefer to use their smart phones or tablets. Just “flip” through the pages by clicking the arrows. The easy-use guide features comprehensive information organized in a region-by-region format, from the coastal areas to the Columbia Gorge, from the Willamette Valley to the eastern Willowa Mountains. Detailed information includes day-use parks, campground facilities, historical sites, natural wonders, hiking and cycling trails, beaches, and much more. In addition, where relevant, a website link is provided, making access to information—phone numbers, reservations etc.—instantly accessible. Our favorite feature? A special symbol indicating the location of dump stations! 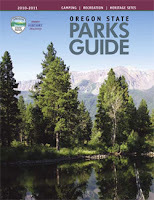 For a print version, call the State Park Information Center at 800-551-6949. Montana has debuted an interactive iPad magazine. Designed to meet the wants and needs of tech savvy geotravelers, Get Lost in Montana -- The Magazine, features journalistic photography, slideshows, video clips and narrative storytelling. The Magazine will be released with four new, free issues per year. The app and the first two issues are available and free in the Apple's iTunes App Store. The third (Fall) issue will be released in late summer. The name of the magazine mirrors Montana’s travel planning, social media site — GetLostMT.com. Launched in 2010, the Get Lost (in Montana) campaign was originally conceived to spur Montanans to more voraciously explore their state’s “backyard.” Now loaded with thousands of insider tips and tales of backwater travel in Big Sky Country, the Get Lost ethos is being shared with (and contributed to by) all travelers. Ocean shore visitors just north of Newport, Ore., reported seeing a loose dock floating offshore near Agate Beach on Monday. The object has since washed ashore and is sitting at the high tide line. Oregon Parks and Recreation Department staff responded to the site, where on Tuesday morning they discovered a metal placard bearing Japanese writing attached to the dock. The Japanese consulate later confirmed that it was debris from the March, 2011 tsunami in Japan. The dock itself is very large and heavy: 7' tall, 19' wide and 66' long. It is made primarily of concrete and metal, but is clearly designed to float. Because of its size and the chance it could continue to settle or be moved by wave action, state park staff are posting warning tape and signs instructing the public to stay off the structure. The dock is covered with marine organisms. Some are native, but others are specific to the waters of Japan. As a precaution against possible invasive species, the Oregon Department of Fish and Wildlife is coordinating a group of volunteers to remove the organisms from the dock starting Thursday morning, June 7, 2012. The salt water-dependent organisms will be removed from the beach. Among the exotic species are different kinds of mussels, barnacles and marine algaes. One invasive marine algae in particular -- Undaria pinnatifida, commonly called wakame -- is present on the structure. State park staff, in cooperation with other authorities, are discussing options to remove the object from the beach. Agate Beach remains open ... just stay off the dock. Chief of Interpretation Ted Stout guides us through Craters of the Moon National Monument & Preserve, a national park formed by a massive volcanic fissure know as The Great Rift. Craters of the Moon was declared a national monument in 1924 by President Coolidge and features a number unique formations, including rafted blocks, cindercones and spattercones, due to the park's volcanic ties. RVtravel.com editor Chuck Woodbury pays a visit to Washington state's Hoh Rainforest and its campground. The rainforest is within Olympic National Park on the Olympic Peninsula. Prepare to be impressed with the experience of camping and RVing in British Columbia. 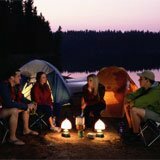 BC boasts a huge variety of camping facilities: seven national parks, approximately 900 provincial parks and protected areas, more than 1,200 recreation sites, and hundreds of private campgrounds and RV parks. Many campsites are accessible by car or RV (recreational vehicle); others provide a rustic wilderness experience. Relax around a crackling campfire, surrounded by stars and the Canadian Rockies. Embark on an RV adventure along the famous Alaska Highway. Or, climb into your tent and fall asleep to the sounds of the Pacific Ocean. Combine camping with activities such as hiking, fishing, biking, hot springs or historic sites. 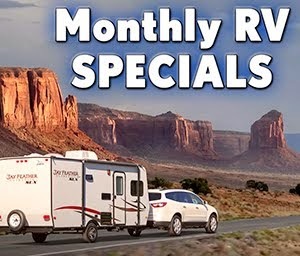 Head out with a single location in mind or sample multiple campsites on a driving tour. And RVers, take note: members of the world’s largest RV owner’s association, the Good Sam Club, declared BC the “Province to Visit” for eight years running in their annual Welcome Mat Awards (2002 – 2008). For a list of campgrounds and RV Parks in BC, visit the Accommodations page and select "Campgrounds/RV Parks" from the Category drop-down menu.